The study of the history of clothing and textiles traces the availability and use of textiles and other materials and the development of technology for the making of clothing over human history. The wearing of clothing is exclusively a human characteristic and is a feature of most human societies. It is not known when humans began wearing clothes but anthropologists believe that animal skins and vegetation were adapted into coverings as protection from cold, heat and rain, especially as humans migrated to new climates; and an alternative hypothesis is that covering may have been first used for other purposes, such as magic, decoration, cult, or prestige, and later found to be practical as well. Clothing and textiles have been important in human history and reflects the materials available to a civilization as well as the technologies that had been mastered. The social significance of the finished product reflects their culture. Textiles can be felt or spun fibers made into yarn and subsequently netted, looped, knit or woven to make fabrics, which appeared in the Middle East during the late stone age. From ancient times to the present day, methods of textile production have continually evolved, and the choices of textiles available have influenced how people carried their possessions, clothed themselves, and decorated their surroundings. 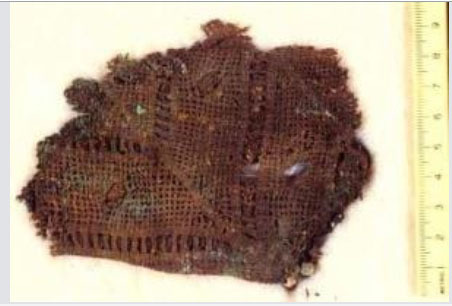 The oldest garments archaeologists have found are all relatively young. There are 8,000-year-old bark sandals from Oregon, a shirt and beaded dress made about 5,000 years ago in Egypt, and the clothing of Otzi - the 5,000-year-old "Ice Man" - who wore leather and woven grass shoes, a fur jacket, leather leggings, and even leather underwear. Ancient burials, for instance - like a 28,000-year-old Homo sapiens grave in Sungir, Russia - "record the ghosts of garments" in the form of beads and teeth that must have been part of clothing. But burial wear wasn't the day-to-day coverings of these people. The record on prehistoric daily wardrobes is sketchy, but Sykes has pointed to a suite of indirect evidence that people were creating clothing tens of thousands of years ago. A Georgian cave has yielded what scientists say are the earliest examples of humans making cords. The microscopic fibres, discovered accidentally while scientists were searching for pollen samples, are around 30,000 years old. A team reports in the journal Science that ancient humans probably used the plant fibres to carry tools, weave baskets or make garments.Some of the fibres are colored and appear to have been dyed. Fragments of ancient fabric Ð some dating back to the time the Coliseum was built in Rome Ð may give researchers better insight into the lives of Native Americans who lived in eastern North America some 800 to 2,000 years ago.